In one sense, a vegan’s daily life is quite predictable; we know with absolute certainty that in any 24-hour period, we’ll be confronted with multiple examples of institutionalized animal abuse. We’ll be watching animals being consumed in lunchrooms, boardrooms, and at family gatherings. The magazines we’ll peruse, T.V. shows we’ll watch, and billboards we’ll be standing in front of, will all be advertising products made of animals. Additionally, we’ll be overhearing conversations of people touting the fun they had at aquariums, zoos, and rodeos. Riding the bus or subway to work, we’re likely to brush up against a couple of Canada Goose jackets, and when we arrive back home, the odor of our neighbor’s meat-laden meal will once again linger in the hallway. So yes, we vegans have a pretty good idea of what to expect each day. 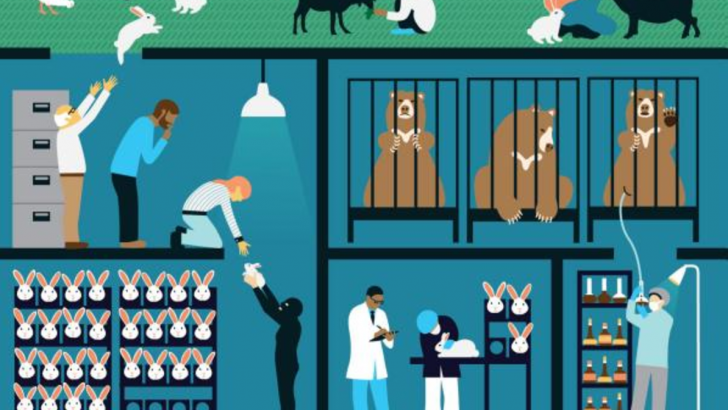 What we’re not always so good at foretelling is how these daily reminders of animal suffering may impact our physical and psychological health. Find a good friend to whom you can vent, or consider forming a support group of fellow vegans and animal advocates. We can all benefit from being around individuals where we feel understood and accepted. Many people find relaxation exercises and meditation to be quite calming. If you find yourself ruminating over something you saw or heard, head to they gym, basketball court, dance studio, etc. Intense physical activity is a great way to get your mind off troubling thoughts. I’ve always been a big advocate of watching a good comedy to uplift the spirits. There’s nothing like some good belly laughs to decrease stress hormones, increase pain-killing endorphins, and relax a tense body. Taking three or four slow, deep breaths is great for obtaining immediate relief after being triggered by something you witnessed or experienced. Of course the best strategy is the one that resonates with you, so take your time finding what works for you. Institutionalized animal abuse isn’t going to disappear tomorrow, which means we can never rule out being triggered by something we see or hear. Having a couple of effective go-to strategies is crucial for overall emotional wellbeing. 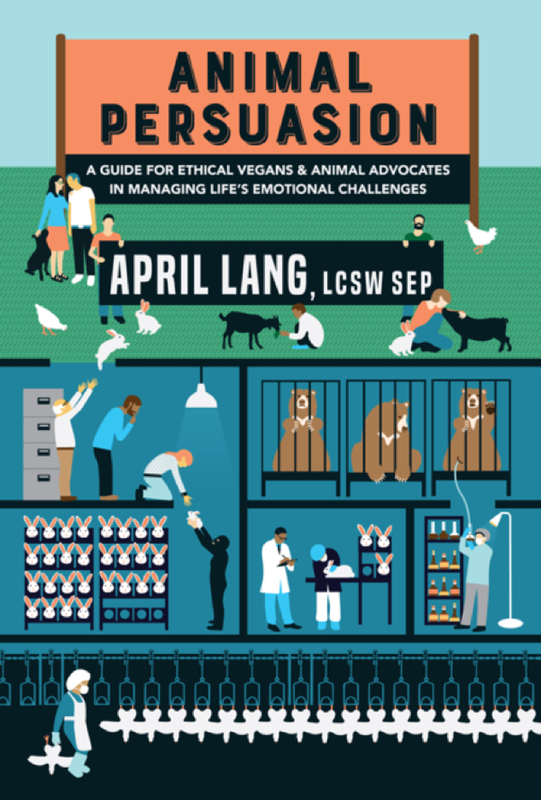 If you’re interested in a more in-depth discussion of this issue, check out my new book, Animal Persuasion: a guide for ethical vegans and animal advocates in managing life’s emotional challenges. It’s currently available on Amazon.com. April Lang is a psychotherapist based in New York City and has been in private practice for twenty years. When in college, she transitioned to vegetarianism and fifteen years ago adopted a vegan diet and lifestyle. She is also an animal advocate with a special interest in humane education, and recently received her CHES certificate (Certified Humane Education Specialist). Writing is something she’s always loved to do and throughout the years, she’s had several of her short stories published. Currently her focus is on nonfiction, especially articles and her new book, Animal Persuasion: a guide for vegans and animal advocates in managing life’s emotional challenges, that look at the intersection between veganism, animal rights, and psychotherapy. She’s written or contributed to articles for various magazines and blogs and currently writes a column called “The Relational Vegan” for LA Fashionista Compassionista magazine.